Whether you are a beginner or advanced student, child, adult, or jumping back in after years of not playing, we will teach you to play at a pace that's appropriate for you. At Music Elements our goal is not only to teach an instrument, but also to show each student how to make studying music enjoyable. We tailor instruction to your musical interests. Anthony Alexander is a Classical Pianist specializing in solo repertoire and also respected as a collaborative musician. Although Anthony primarily plays classical music, he is capable of playing and teaching all styles. In his lessons, he incorporates aural skills, ear training and technique early on as he believes this is fundamental to piano playing. Anthony began studying piano at age 11 at a local music school and also took up lessons in clarinet and flute. At age 16, he began studying with Piruz Bogossian, who taught Anthony the discipline necessary to be a classical pianist. At UMass Lowell, he has studied with Hey Rim Jeon (Berklee Alumnus) and Jacob Hiser (NEC Alumnus). He also studies remotely with Spanish concert pianist, Ignacio Almarche, who comes from a lineage of teachers that can be traced back to Arrau, Liszt, Czerny, and Beethoven. Anthony is active as an organist in the Armenian Apostolic Church, an accompanist at UMass Lowell and fluent in the languages of English, Spanish, and Italian. Ben Knight has been playing shows all throughout New England for the last three years, fronting a high energy Rock and R&B band. 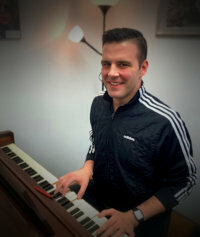 Taking influence from Little Richard, Jerry Lee Lewis, and Fats Domino, Ben has been cultivating his own style of piano playing since he started taking lessons at Music Elements almost ten years ago! In addition to theory, sight-reading, and technique, Ben teaches ear training, improvisation, and how to play with other musicians at a pace that is appropriate but challenging for the student. Alex Buiel is a classically trained pianist, vocalist and pipe-organist working in metro-Boston. He began his piano studies at age five and shortly after began studying pipe organ and voice. He was a choir boy at St. Paul’s Choir School and studied pipe-organ while attending the Interlochen Academy for the Arts in Interlochen, Michigan. He has worked as church pipe-organist for more than a decade, toured England singing with the choir of Trinity Church, Boston, and is currently the Organist and Director of Music at St. Anne’s Parish in Readvile, MA. In addition to his classical and liturgical music, he has extensively worked as a session musician for many bands in the metro-Boston area as well as plays keyboards in several groups. Taylor is studying music education with a minor in psychology at the University of Massachusetts Lowell. She has been playing piano for 15 years now. Before attending UML she studied primarily classical music, but have transitioned to studying more minimal and experimental music since attending the university. In her free time, she enjoys reading a book or adventuring with friends to new places. Some of her other hobbies include photography, DIY crafts, and baking! She has a cat who is 2 years old named Muse and loves spending time with her.